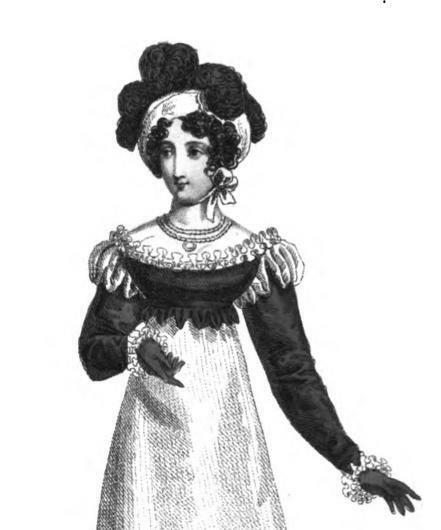 The canezou is a type of spenser–this one is in black satin and part of a “fancy mourning dinner dress.” From the December issue of La Belle Assemblée, 1818. Having left the out-of-the-way society of her “good aunt Charlton,” Adelaide went to live with another aunt, as dashing as the former was dull. Lady Worthington was the sister-in-law of the gel’s father, and had a daughter of her own, “lovely and gentle.” Under the aegis of Lady Worthington, Adelaide soon received a very eligible offer of marriage. Glumly, Maria submitted to wearing lace and Bengal muslin, with a wreath of Mrs. Bell’s finest “full-blown white roses.” Her companion, Lady Worthington’s daughter, wore white spotted crepe fashioned into an Oriental robe, her dark loveliness set off beautifully in a net bonnet trimmed in small white roses. Maria’s husband, Mr. Fitzosborn, was lucky enough to escape having to wear white. Instead, he wore a finely tailored coat in a grey-green sage color, his only nod to the bridal request to wear white being found in his waistcoat and silk stockings. He looked so well that many mistook him for the bridegroom. In a grand departure worthy of Ianthe, that remarkably spoilt, impulsive character in Georgette Heyer’s Sylvester, Adelaide embarked on her wedding trip to the bridegroom’s country estate wearing a “celestial blue” pelisse of sarsnet. It was a pity the bride chose, as was her lamentable habit, a bonnet which quite hid her face–a Leghorn of immense proportions. 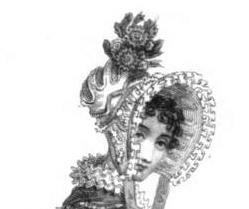 This entry was posted in Regency, Uncategorized and tagged canezou, Regency wedding, transparent bonnet by Angelyn. Bookmark the permalink. Another wonderful post from Angelyn!